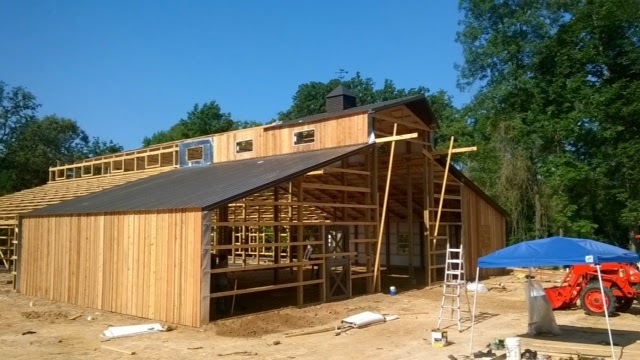 As summer is in full swing so is National Barn Company with their post-frame building construction projects. The pole barn builder is no newbie to the pole barn construction industry, they have been at this for over 20 years and thousands of clients to boot. From garages to storage sheds and almost any type of building needed they have designs and options to choose from including metal siding colors, and a whole list of custom features if you want to completely jazz out your building. They have an entire categorized gallery you can browse to see tons of buildings they built and give you ideas for just about any building you can imagine. What's important to note if you're looking to build a pole barn is National Barn Company will handle most of the entire process and keep it simple for you. Including free consultation for what steps you need to get started along with building permit plans. Depending on your state, you'll be advised on building codes and any items you'll need to have in place as you begin the process. We have interviewed their National Barn team and the staff are very friendly and easy to work with. So after you've taken a look around the website, then you can use their quick quote request to fill out your information and get a quick estimate. Or you can take a little more time and use their detailed quote request form to select most options you desire for your new pole barn building.